We’re kicking off the holiday season the right way with a new twist on a classic winter tradition. This year, you can count down the days on the Yu-Gi-Oh! TRADING CARD GAME Advent Calendar, hitting shelves November 2, with a bevy of holiday-themed cards – each calendar features 24 doors, each hiding a different card to help you Duel your way into the holiday spirit! The calendar contains 24 cards: 14 Super Rares and 10 Ultra Rares. MSRP: $19.99 per Calendar. Launching November 16, Duelists will be able to get their hands on Hidden Summoners is available November 16 with 60 cards: 40 Super Rares and 20 Ultra Rares. MSRP: $3.99 per 5-card Pack. 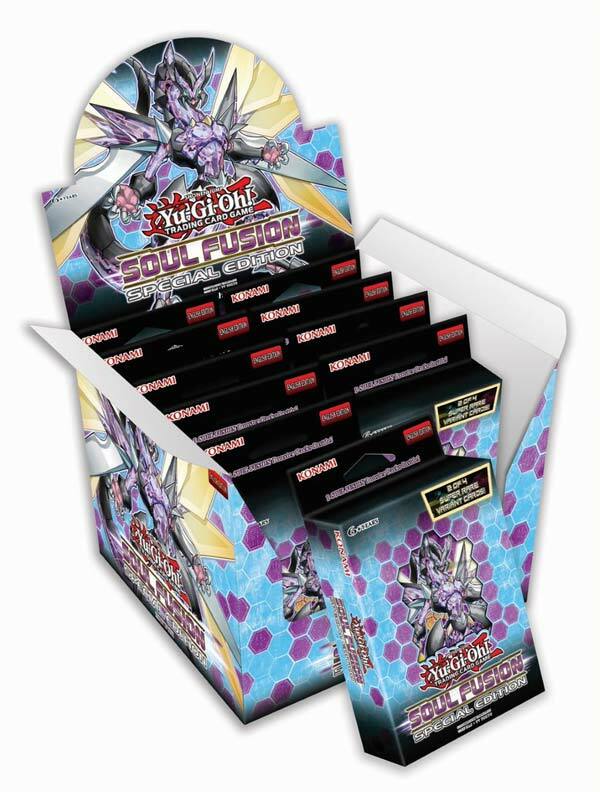 Making its debut December 7, Soul Fusion Special Edition contains 3 Soul Fusion Booster Packs, plus 1 of 2 Super Rare preview cards and 1 of 2 Super Rare variant cards. MSRP: $9.99 per Box. El Segundo, Calif. (October 30, 2018) – Everything old is new, and everything departed lives again in the Yu-Gi-Oh! 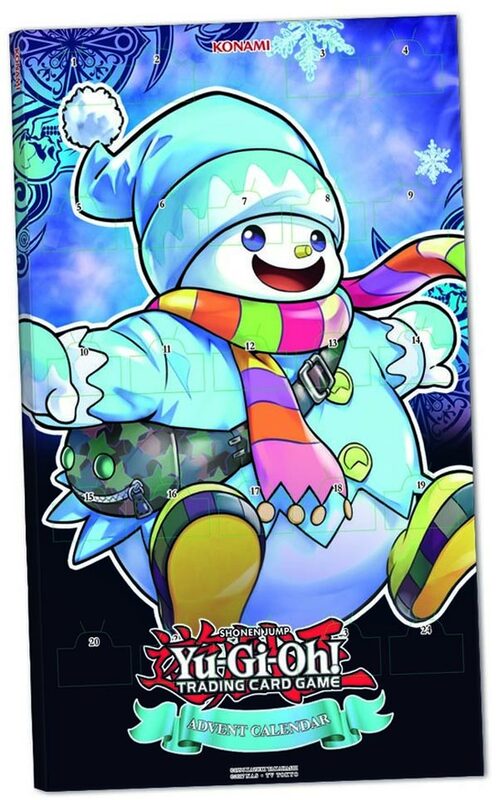 TRADING CARD GAME (TCG) this Winter! Konami Digital Entertainment, Inc. (KONAMI) is bringing back some of the biggest cards of the year, some popular themes from past eras, and some classic card effects with four new releases. And what else is coming back? Monsters from beyond the grave! Whether you’re a casual competitor or a veteran tournament Duelist, KONAMI’s got you covered this holiday season. …Covered in Zombies, that is! Structure Deck: Zombie Horde brings powerful new support for Zombies, including the Vampire theme from Dark Saviors and a new Zombie tribe in the upcoming Hidden Summoners booster set. Classic corpses like Mezuki and Zombie Master are back alongside spooky staples like Shiranui Solitaire and Uni-Zombie, all united under the banner of the mighty Doomking Balerdroch: a stunning new Zombie that claws its way out of your Graveyard every turn, so long as you or your opponent control a Field Spell. Armed with powerful negation and banishing abilities, the undead behemoth works to punish opposing Zombies. Necrotize your opponents’ legions with Zombie World, then shut down their effects and banish them from the Duel! Search your Zombie World straight from your Deck with the new Necroworld Banshee, then revive it to protect your Field Spell from destruction and targeting. Unleash powerful Zombie Synchro Monsters with Glow-Up Bloom and if you control Zombie World use Bloom’s effect to Special Summon a massive Zombie straight from your Deck. Tatsunecro offers even more ways to Synchro Summon, helping you unleash the power of Red-Eyes Zombie Necro Dragon! And if that wasn’t enough, new Spell and Trap cards return from the Graveyard just as easily as your zombie hordes, mimicking incredible cards like Change of Heart*. 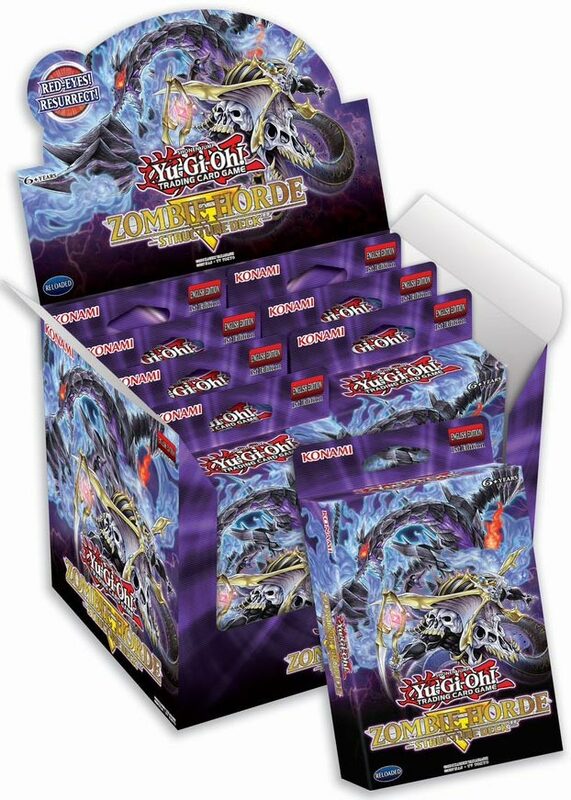 Structure Deck: Zombie Horde arrives November 2 with a Double-sided Deluxe Game Mat/Dueling Guide, a Beginner’s Guide, and a total of 42 cards: 37 Commons, 3 Super Rares, and 2 Ultra Rares. MSRP: $9.99 per Box. To properly kick off the holiday season, the Yu-Gi-Oh! TRADING CARD GAME Advent Calendar puts a new spin on an age-old winter tradition, counting down the days with a bevy of holiday-themed cards! Power up your Decks with Super Rare and Ultra Rare variants of popular cards, and find festive favorites like Toy Magician and Box of Friends. Each calendar features 24 doors, each hiding a different card to help you Duel your way into the holiday spirit! The Yu-Gi-Oh! TRADING CARD GAME Advent Calendar launches November 2 with 24 cards: 14 Super Rares and 10 Ultra Rares. MSRP: $19.99 per Calendar. Looking for another round of undead action? A new breed of Zombies creeps from the shadows of Japanese lore in Hidden Summoners, a 60-card all-foil booster pack! The Mayakashi take Synchro Summoning to a new level with five new Zombie-type Synchro Monsters: reuse their Tuners with their special abilities, and you can climb all the way from a Level 5 Synchro Monster to a stunning Level 11 Synchro! Even better, each Synchro Monster reinforces the next: if your higher-Level Synchro is destroyed, you can revive the next one down the chain to keep control of the Duel. Hidden Summoners introduces two more themes as well. First up, the Prank-Kids, a squad of science-styled pranksters combine and cooperate to assemble into new forms, flood the field and build their forces on the way to replicating the effects of Raigeki* and Harpie’s Feather Duster*! Hidden Summoners also fans a long-cooled ember in the hearts of veteran Duelists: Sacred Phoenix of Nephthys rises from the flames, reborn as a powerful new Ritual Monster! The reinvented Nephthys theme revolves around flurries of fiery Ritual Summons fueled by a pair of new Link Monsters: one that powers your Ritual Summons, and another that powers up for every Ritual Monster you use for it. 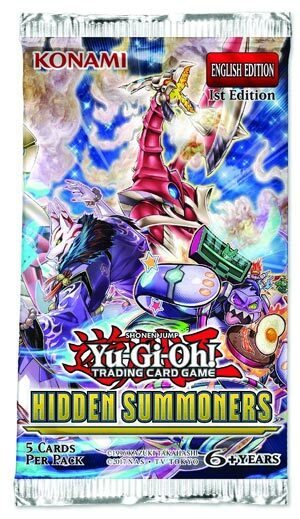 Hidden Summoners is available November 16 with 60 cards: 40 Super Rares and 20 Ultra Rares. MSRP: $3.99 per 5-card Pack. And finally, some of the most awesome and competitive cards of the year return in Soul Fusion Special Edition. Isolde, Two Tales of the Noble Knights was one of 2018’s biggest Link Monsters, becoming an anchor for Warrior strategies like Goukis and dominating tournaments. Now she makes her return, just in time to lead a second charge of Soul Fusion Noble Knights! Isolde is matched by another Duel-defining Link Monster, one that up until now was only available as a scarce North American promo card: Summon Sorceress. Unleashing monsters from your Deck according to what her Link Markers point to, Summon Sorceress devastated tournament competition this year. Each Soul Fusion Special Edition includes 1 of these 2 mighty Link Monsters as a Super Rare Variant. Each Soul Fusion Special Edition also includes 1 of 2 Super Rare Preview Cards from next year’s Savage Strike booster, plus three packs of Soul Fusion for an unbelievably low price. It’s your second shot at all the “Noble Knight,” “Thunder Dragon,” and “Danger!” monsters you need to heat up your tournaments this winter. Chaos Dragon Levianeer returns for another go-round, plus powerful Spells and Traps like Extra-Foolish Burial, Trap Trick, and Frightfur Patchwork. Soul Fusion Special Edition debuts December 7 with 3 Soul Fusion Booster Packs, plus 1 of 2 Super Rare preview cards and 1 of 2 Super Rare variant cards. MSRP: $9.99 per Box.